Tickets are $7 for adults, $5 for kids 6-18 and Seniors may be purchased with cash or by credit card at the door on either day. Kids 5 and under are free. 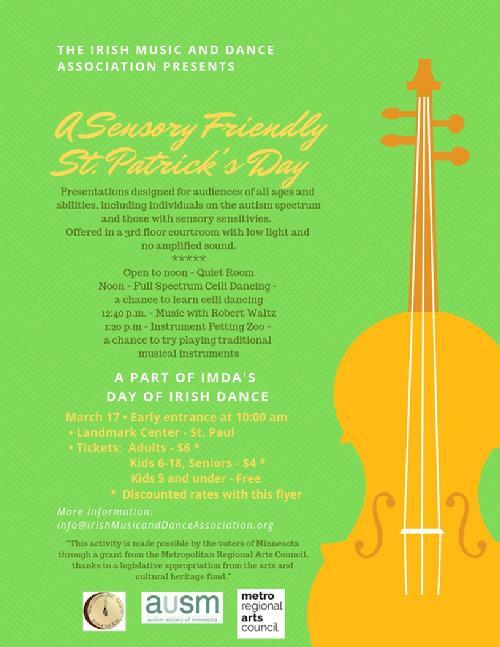 Group discounts can be arranged by calling 651-341- 3618 or e-mail at Info@IrishMusicandDanceAssociation.org. Early Open - Families may take advantage of coming to Landmark Center early – beginning at 10:00 a.m. The early entrance gives families a chance to make their way to Courtroom 317 before the crowds start to build. Discounts on tickets are available if guests bring the flyer. Additional information about the events with detailed Frequently Asked Questions and a Social Narrative explaining what to expect. 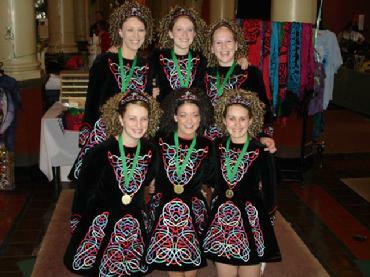 Beth Pitchford will offer her “Full Spectrum Ceili” dance class. Robert Waltz, a musician who has autism will play guitar and sing. Mattie Ernst and Iain Dove Lempke from the Center for Irish Music will bring the “Instrument Petting Zoo” – a selection of traditional musical instruments for the visitors to try. This programming was developed in consultation with the Autism Society of Minnesota. If you have family and friends with sensory sensitivities, please share this opportunity with them. Following these presentations, families are welcome to enjoy Irish dance and music on the other stages for the remainder of the day. For more information, contact Jan.Casey@IrishMusicandDanceAssociation.org.